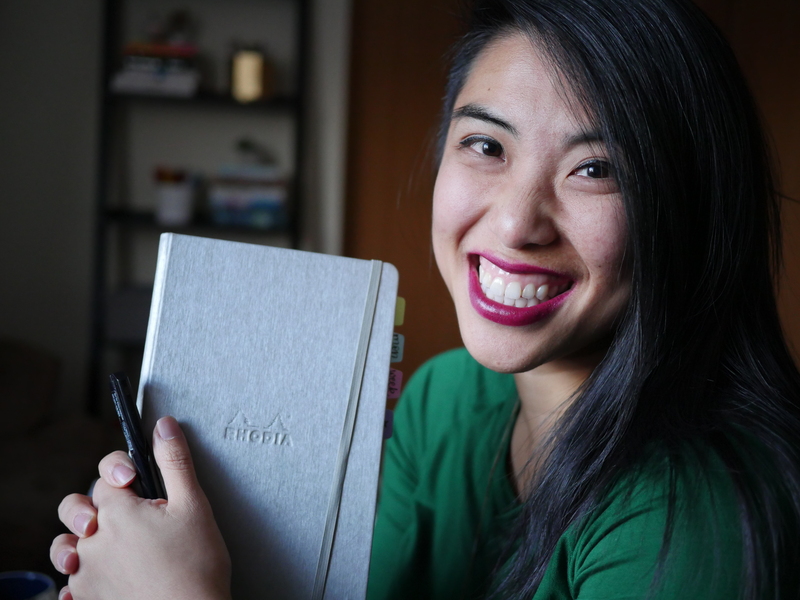 Usually I share my monthly set up – but this month I’m not changing much, so I figured I’d finally show you how I’m using the bullet journal system in connection with other systems to teach. If you know me you know I’m an educator which means I finally got bullet journal stuff together for the fall semester! I’ve talked about some different layouts I use in my teaching and administrative role here, but here’s how I’m using my system specifically for fall. I show a few photos but it will make the most sense in the video! For context, I teach one University-level course of 30 and fewer students. This will make the most difference as you listen through the video; adjust what you need to in order to make it work best for your situation. Note: This post contains affiliate links, which simply means if you happen to purchase anything, I make a small commission that helps me do things for this blog. Thanks for your support! MY NOTEBOOK SYSTEM. This is essentially my planner squad for teaching (and my work in general). From the front to back, I have my dotted Leuchtturm for work notes in general (including my teaching planning pages), my Foxy Notebook for my everything bullet journal, and my Levenger circa disc-bound binder for my class. My Foxy is my to do list – if I have to do it, it goes in there, personal or work. For teaching this means “finalize lesson plan,” “create slides,” “print quizzes,” and grading trackers. My teaching binder is a full size Levenger circa, and inside I have the pockets and dividers to create my sections. The letter size is crucial because I print my lesson plans everyday and the ability to rearrange is so helpful, allowing me to reuse it every semester. The rest of this post will focus on what is inside this binder. COVER. For fun, and as a grounding thought, I added this quote from one of our readings – my favorite one – to remind me what I’m doing this for. (Handlettered with a Pentel Sign Brush Pen). VISUAL CALENDAR. In Syllabi, the course calendar is typically on a line by line basis, which isn’t the way my visual brain sees time. Since I create a visual calendar for my own planning purposes to begin with, I create this for the students as well. There are a lot of (potentially) moving deadlines in the class, and a lot of stuff we try to do in class that I want to reduce the amount of technical confusion. This also allows me to keep them accountable to the resources I’ve provided. I created this in Google Slides with a color block and tables. LESSON PLANS. I teach twice a week, and keep my lesson plans in Google Drive for ease of sharing and updating. The class I teach can be really fluid, which means that I’m almost always adapting each day’s plan for what happened the class prior – hence the digital format. This is the structure, inspired by a friend of mine, that I use for all my lessons. I talk about each section on the video, but I invite you to modify it for whatever categories you need! Download my lesson plan template here. Notes about what changes I need to make for next semester, assignment tweaks, better discussion questions and facilitation techniques, etc. READINGS. Now that I’m not a student, I’ve figured out a great way to take notes on readings (LOL). I use these long sticky notes as my key overview. As I read, I take notes in the margins and highlight the article as usual. When I decide that something is a critical point, a question, a quote, I add it to the long note. In the circles I add the page number for reference, and color it in red, green, or yellow. Red means it’s a point I don’t understand, yellow is that I need some more discussion but I kind of understand, and green is YES, this resonates with me and is something I want to talk more about. Having these stickies has been extremely helpful in preparation, because I don’t have to skim through the whole document. So that’s what I’m using this fall. Want more ideas? Check out 16 layouts I have for educators. Is there one you’re using that might help me? I’d love to hear down below! Thank you so much, Jessica! I am new to Bullet Journaling, and I’m trying it this semester. I am going from a digital task management system to analog again. I am quite inspired by Ryder, Kim, and others, but especially by you and your wisdom in higher education. Your system makes so much sense to me. I have Levenger, but I’ve never had it organized well. If you were creating this over again, would you still use your LT1919 journal, or would you instead incorporate those higher level teaching notes in either your Levenger journal or the Foxy planner? Also, do you keep other notes, gratitudes, collections, etc. in your Foxy? Lastly, if you were teaching more than one course, do you think you would have separate Levenger books for each class or one notebook with different sections for the classes? This is my first time ever commenting on social media, but I had to tell you how helpful you’ve been. Hey Erin!! I do have a few journals. But I have found that I didn’t use the page in my teaching planner to track my changes, but I put them in my other notebooks… I need to refine that and just put the changes to track in ONE PLACE – that definitely was a fail on my part, but we’ll try again next semester! I am envious of your organization!! I teach 9-12 Art!